Figure 1. Conceptual model of a HT-MTES (GZB). 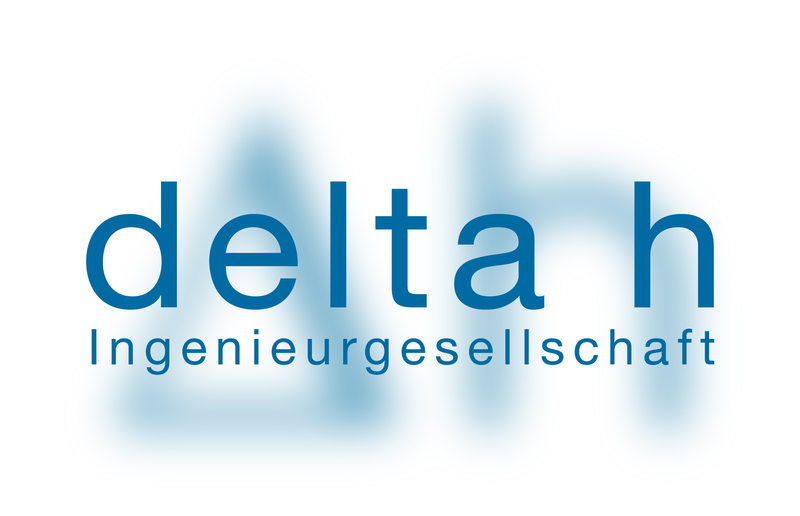 The aim of the German HEATSTORE sub-project is to create a technically and fully functional high temperature mine thermal energy storage (HT-MTES) pilot plant (see fig. 1) for the energetic reuse of the abandoned coal mine Markgraf II, with the emphasis on a two year operating and monitoring phase during the project lifetime of three years. The generated data can be exploited for the implementation and dissemination of future deep geothermal storage systems. 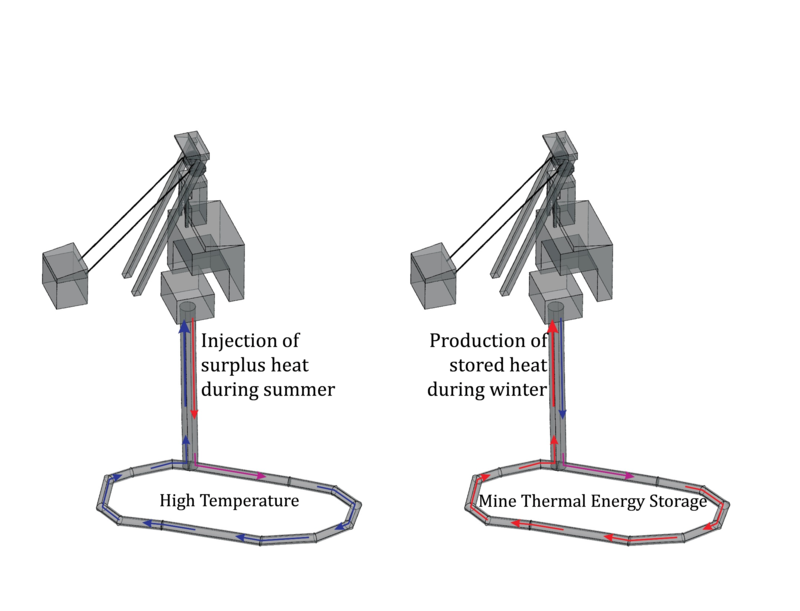 The conceptual idea is based on the storage of seasonal unutilized surplus heat during the summer from solar thermal collectors within the mine layout and to use the stored heat during the winter for heating purposes of the institute buildings of the International Geothermal Centre (GZB). The concept of this pilot plant aims at the reutilization of the abandoned coal mine Markgraf II, which is directly located under the premises of the International Geothermal Centre (GZB) in Bochum, as a high temperature mine thermal energy storage. This area also includes the drilling and test facility site of the GZB, on which the Bo.REX (Bochum Research and Exploration Drilling Rig) is currently located. This leads the way of a very cost effective exploration of the flooded Markgraf II mine in a depth of approx. 75 m below ground. The injection and production well and additional monitoring wells will be drilled with the GZB drilling rig. Currently, the groundwater level resides at a depth of approximately 21 m below ground. Overall, the Markgraf II mine produced 37,043 tons of coal. Based on a calculation with a coal density of 1.35 g/cm3, we can assume a void volume of approx. 27,439 m3. This volume does not include any drifts and shafts, which need to be analyzed based on the mine layout. Considering the effect of mine subsidence, the remaining void volume will most likely be in the range of approx. 10%. Utilizing a Δt of 50 K within the mine water, a heat capacity of approx. 165 MWh, which resembles the yearly heat demand of the GZB compound, could be stored within dedicated drifts and former mining areas of Markgraf II for the heating season. Based on this first evaluation, the yearly GZB heat demand could be substituted by emission free solar thermal energy. After the two year pilot phase is concluded, the integration of the Markgraf II MTES into the district heating network of the “unique Wärme GmbH” could be tackled, as two CHP plants (7.2 MWth) were put in operation in July 2018 in a very close proximity of approx. 350 m to the GZB pilot plant. Cost effective drilling (GZB owned drilling rig and equipment). Markgraf II colliery located below GZB premises. During the upcoming project phase, the implementation of three exploration wells into the existing mine layout of the Markgraf II colliery is foreseen. An approval by the water authority of Bochum for these three wells has been received. Pump and tracer tests will determine possible storage capacities.